Insert a 12-gram CO2 cartridge, reinsert the rod and tighten the screw. Black gun shown for demonstration purposes only. *Your box and owner's manual may show a lower velocity, which Crosman states as "average velocity." However, 625 fps is the max velocity with lead pellets. If you shoot as fast as you can pull the trigger, your velocity will be lower. Since CO2 is a refrigerant, you will receive somewhat fewer shots and lower velocities compared with waiting 5-10 seconds between shots. This applies to all CO2 guns. 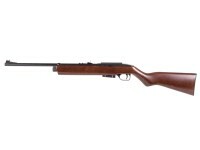 Crosman's 1077 was chosen for the 2001 Bikathlon Event at the Boy Scout Jamboree. Things I liked: I love this pellet rifle. I was hesitant to write a review without testing it first. Just got a few weeks ago. I wanted to see if I could leave the CO2 cartridge in it between shooting it. I'm 73, and only get a chance to shoot it every few days, and then only a few shots. I have lost more than one gas seal from slowly letting the air out of a CO2 cartridge. It hurts it worse to let the air out, than leaving the cartridge in, so long as you haven't over tightened the cartridge to begin with. I've left CO2 cartridge in my Crosman 2400 for months, and I've had it 15yrs. No problem. So far I've had no problem with the 1077W. It's got plenty of power, and holds pressure great. I use a target on cedar laths that you use to bank a home for winter, and it drives a pellet thru the lath. 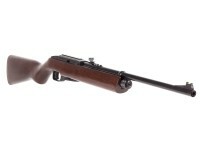 If anything were to go wrong with it, seeing it's all plastic, I'd buy the 1077, and put it in my wood stock. Things I would have changed: Make a more expensive rifle out of metal. People would still buy them. What others should know: Just that it does as much harm leaking air past the seals as it does leaving the cartridge in. Except if you have children in the house, than you should remove the cartridge in order to prevent an accident. I have no children at home, and my guns are locked up with the firearms. Things I liked: Things that I like so far are of course the wood stock. 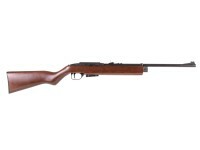 I just think rifles look so much better dressed in wood than plastic. The weight, or the lack of is nice. The multi-shot rotary clip and mag are nice. Buy extras! Things I would have changed: Metal instead of plastic for the breach and scope dovetail. I understand that would up the cost a bit but I would pay it. The grip on the wood stock is too thick for smaller hands. I bought this with the intention of shooting with my children, so the beefy grip is an issue. I'll just have to buy the synthetic stock version now too. What others should know: Tried a variety of different pellets. All performed well at 10 yards. Yes that is a short distance but reasonable for this lower powered co2 rifle. RWS Meisterkugeln and Hobby's did very well. Tried the heavier Beeman Kodiaks/H&N Baracudas but the round nose pellets wanted to jam the rotary clips. The nose is just a hair too long. Crosman Premier HP's did well too. Also as stated above, If you intend to buy one to introduce your children to shooting consider the synthetic stock version. The wood has a pretty beefy grip. Buy one in either version! Too much fun. Things I liked: Wow, what a fun gun. I have forgotten how enjoyable it is to shoot a semi auto CO2 gun like this one. The 12 shot mag is easily loaded and works flawlessly. The accuracy is excellent even with the long trigger pull and rudimentary sights. Sights were dead nuts on from the factory. It weighs next to nothing for someone used to shooting NP guns that weigh in at 8-10 pounds. I can shoot this gun with one arm. I should have bought one of these a long time ago. Things I would have changed: I would remove some of the very sharp edges. What others should know: This is a fun gun for sure but also hits what you are aiming at. I didn't chrony it but I would guesstimate a min. of 500fps. The 1st 12 shots I fired at 15 yards could be covered with a quarter. After 4-5 magazines the CO2 needs to be changed. The rear sight on mine is razor sharp and needs attention. 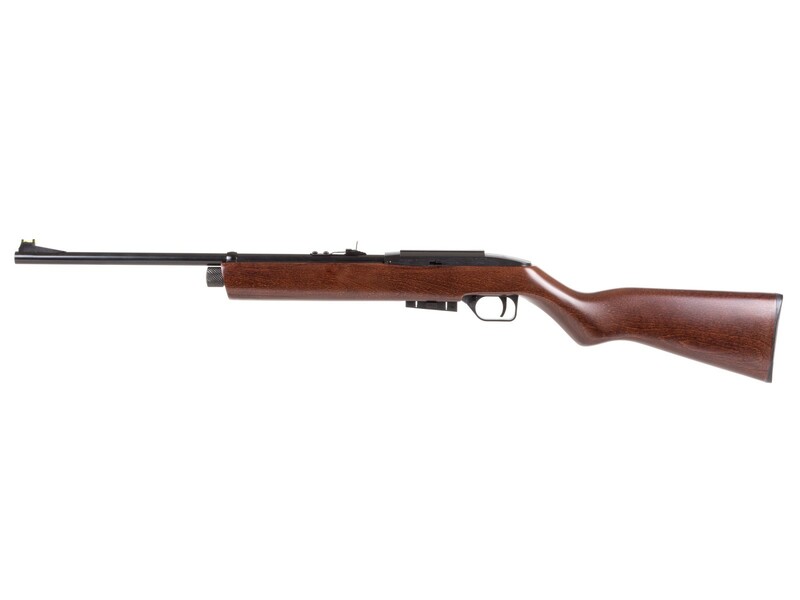 What is the trigger pull on the Crossman 1077W? What is the best pellet to use and what grain weight? 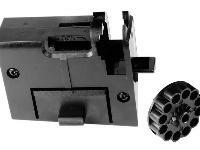 Crosman site say the plastic version is built in the USA, no such note on the wood version, can anyone confirm the country of manufacture? Would really like to support the Crosman US based folks and purchase a rifle model that is still being manufactured domestically. Ok I took the chance and ordered one anyway, so I'll answer my own question. Yes it is made in the USA! Or at least assembled here which is a positive in my book. I'll add an observation, the wood on mine is significantly darker than the picture above or examples I've seen online, not a complaint just an observation. 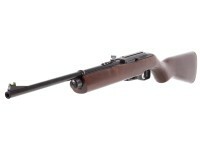 The examples I have seen are very close to the tone of my 10/22 the 1077 I relieved is more like a dark furniture color.